Wanting a sit down luncheon where you can talk and be treated like a lady or gentleman. Want to see desserts that are hard to pass up and decide between either a hearty or delicate meal choice? If so, do what I did, visit the Wild Hare Cafe in Elkhart, Illinois. Traveling back from Pekin after a car repair, my mom and I wanted something a little different than the usual food fare. The cafe is owned by Andrea Niehaus. 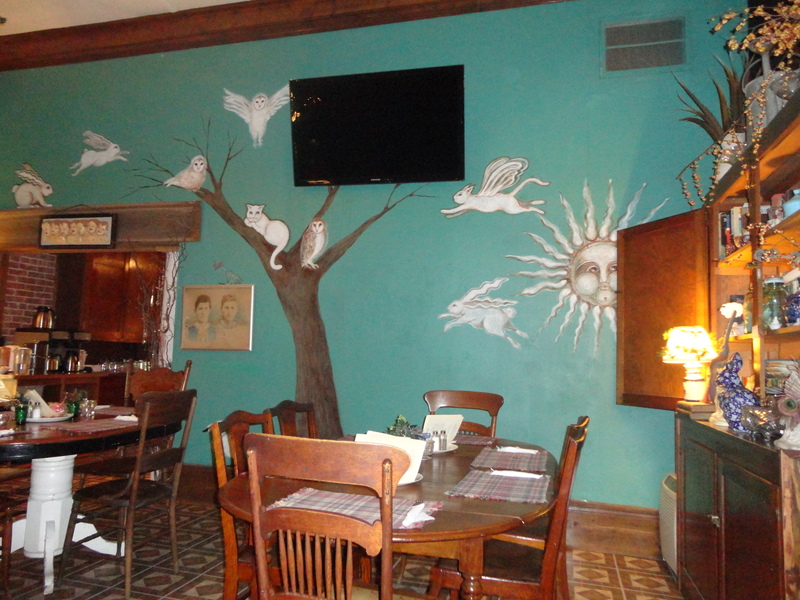 The cafe is designed to fit the name with wild hares, owls and other creatures painted darting about the walls and perching on painted limbs for diners enjoyement. The cafe is in the rear of Niehaus’s gift-and-antique shop which makes the visit even more fun to linger and look. Dragonfly Art Studio is located in the attached building where Renee Sisk, an accredited and recently retired 25-yr. high school art teacher, holds painting classes that are open to the public. The cafe is located in a former brick bank and is on a little one road street that adds to the charm. Check it out -http://www.wildharecafe-elk-il.com – we did! Next Post: The Museum of Westward Expansion gets harry!